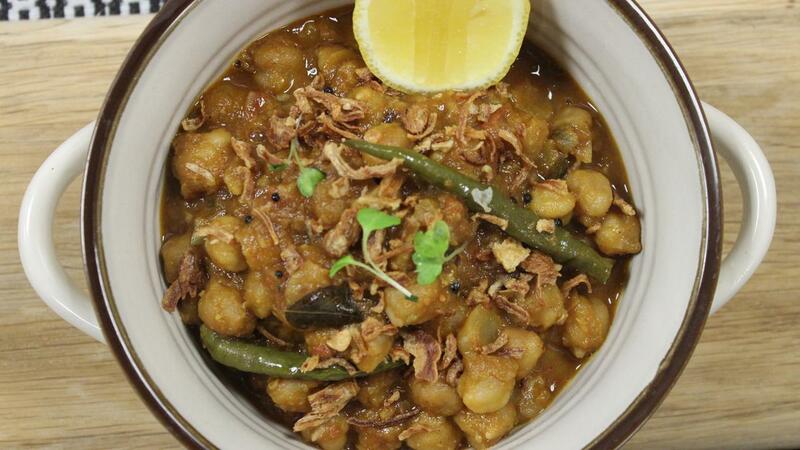 Chana Masala also known as Spicy Chickpea is a Pakistani dish from the east spicy in taste. We have given this dish its own flare with our marinade spice solutions. A great recipe for everyday of Ramadan. Combine garlic, ginger, chillies, 1 tablespoon lemon juice, and 1/2 teaspoon salt in a small work bowl of a food processor and pound or process until a fine paste is produced. Heat Rafhan Corn oil in a large saucepan or Dutch oven over medium-high heat until shimmering. All at once, add cumin. They will sputter and spit for a few seconds. As soon as they are aromatic (about 15 seconds), add onion all at once. Cook, stirring frequently, until onions start to leave a brown coating on bottom of pan, 3 to 4 minutes. Add 1 tablespoon water, scrape up browned bits from pan, and continue cooking. Repeat this process until onions are a deep brown, about 10 minutes total. Immediately add paste all at once and stir to combine. Add coriander, turmeric, Knorr Chicken Cube and 1 teaspoon gram masala. Stir until fragrant, about 30 seconds. Add tomatoes and crush them using a whisk or potato masher. Add drained, rinsed chickpeas and cilantro, reserving a little cilantro for garnish. Add 1/2 cup water. Stir in remaining gram masala and lemon juice. Season to taste with salt. Chana masala can be serve in the bowl or plate. Fried onion and fresh coriander lemon wedges on the top serve with naan or rice.